can’t be recovered by any data recovery software or service. Selectively and permanently erase selected files or folders from Mac machine or storage media under OS X. You don’t have to wipe the entire hard drive. Completely and conveniently wipe Mac hard drive or storage device to destroy and erase all existing data, lost data, history data on the hard drive or storage media. 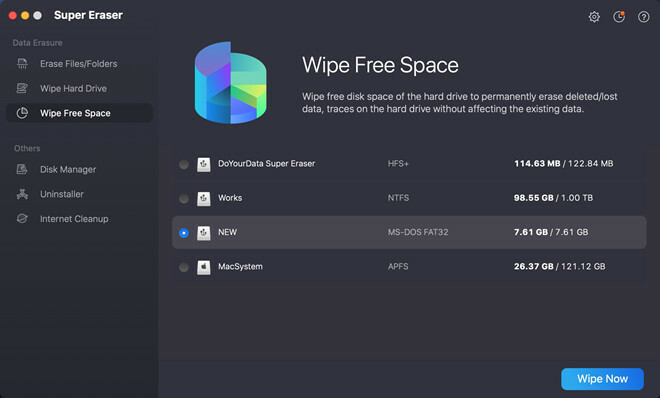 One-click to wipe unused disk space on Mac or storage media to permanently erase lost data or traces on the unused disk space. This leads to a cleaner, safer and more efficient hard drive. 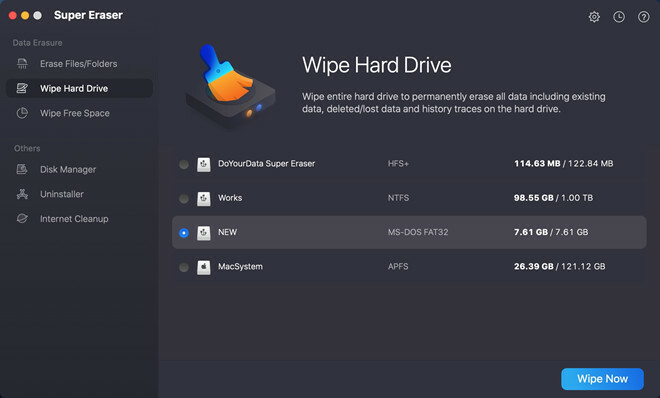 Before you resell, donate, discard your Mac or storage device, you’d better permanently erase partial or all of data on it to protect your privacy. Permanently erase personal data when you withdraw from a shared Mac in public environment (maybe including the situation you share the same Mac with your family members). Permanently erase very important & sensitive data like financial data, privacy information if you don't want it to be used by cybercriminals. There are many reasons why people want to permanently erase data like freeing up disk space, removing virus-infected files etc. Very efficient tool to erase data from Mac SSD.